This is the history of Crom Cruach, the Blackstone Cabal, and the Wardens. This history forms the basis for the main storyline behind Celtic Heroes. A long time ago the gods came to Dal Riata, but found one god already held dominion there. This god was Crom Cruach, the ancient god of chaos and sacrifice, who was more powerful than the other gods, and he held control over the world. After a long battle, the gods won, and Crom Cruach was sealed within their own fortress of Rath Parras in the Otherworld - the parallel realm of magic that lies alongside this world. Crom's prison within this fortress is a mighty standing stone, to which he was chained. The gods channeled Crom's powers into six large discs of stone, draining him of his mighty powers. Nuada, the king of the gods then chose the strongest and bravest mortals to stand watch over Crom's prison. These champions became the first Wardens. There were five wardens initially, and they were the most powerful: Bloodstrike the Brave, Goldsong the Wise, Greythorn the Vigilant, Loremantle the Learned, and Moonshadow the Swift. For many years they held the Discs that contained Crom Cruach's power, but eventually new heroes were recruited too, and soon the Wardens became a powerful force in the Otherworld. For ages, the Wardens served the gods and guarded Crom in the god's fortress of Rath Parras. In time, there were hundreds of Wardens; a noble brotherhood of warriors, rangers, rogues, mages and druids. However, not all of of them had the strength of those first five mighty heroes. Although Crom Cruach was held within his prison, his power still lay within the Discs that were in the possession of the Wardens, and he could still reach out and manipulate those who showed any sign of weakness. The gods were helpless to stop this from happening, for during this time the children of the Morrigan came to the gods in peace, and offered them a brew that was secretly laced with poison. When the gods drank the concoction, they fell into a deep and timeless sleep. The poisonous brew slipped from their hands as they sank into slumber, and it poisoned the Otherworld. From the poison, the seed of Dradriel settled in the rich soil of the Otherworld, and flourished. Draedril was a plant that spawned in the dark grove of Badan Olc, which was fed by the blood of the Morrigan itself. The Dradriel crept into Gelebron's mind, poisoning his thoughts. Believing its lies, Gelebron started thinking that he was more powerful than Crom Cruach, who is imprisoned in the fortress of Rath Parras in the Otherworld. Gelebron began seeking a way to free Crom from his prison, so that he could feed off of Crom's powers. What he did not know was that Crom was influencing his will, feeding him lies. Gelebron also did not know that Crom was speaking to Gelebron's apprentice Piranus as well, tempting him with power to rival Gelebron. As the noble Wardens now seemed tense and quick to anger, Gelebron, too, was becoming more isolated, and would spend his days locked in his private chamber, chanting in a language Piranus had never heard. Crom Cruach could not make any direct action of course, but he did not need to. All the chaos that is wrought in Crom's name replenishes his power. He merely began to place doubts in the minds of those who lingered too long around the Discs, and soon those doubts began to be spoken out loud. A rift began to form amongst the Wardens of Dal Riata. On one side, there were those whose minds were strong, who stayed loyal to Nuada and the other Celtic gods. Their opponents were none other than the fellow Wardens, who had now unified under one goal - to seize the Discs and open the prison, releasing Crom Cruach once more into the world! The very first Warden to side with Crom was Madoc, who would become Madoc Blackstone, the creator of the Blackstone Cabal. The Blackstone Cabal are the chief followers of Crom, and seek to free him of his prison. A mighty battle raged between the two factions. In the end, the Wardens were decimated. As the Wardens fell in the raging battle, the Blackstone Cabal would resurrect the Wardens as wraiths to fight alongside them. In their last act, the Wardens sealed the fortress of Rath Parras behind them, and fought their way to the portal back to Dal Riata. Only a handful of Wardens made it back through the portal from the Otherworld, smuggling the disc seals with them. The remaining wardens stayed behind in the Otherworld to buy these few Wardens time to escape. As the battle raged, Crom called upon his new servants Gelebron and Piranus to join the battle. But Piranus recognized Crom's promises of power as lies, and betraying Gelebron, he fled the tower of Gallan Marrek, locking the doors behind him with a powerful spell. With Gelebron sealed inside, Piranus fled through the portal to seek refuge in Dal Riata. The escaped Wardens then sealed the portal and smashed the discs, casting their fragments to the wind so that the Blackstone Cabal could never free Crom from his prison by assembling them. However, Crom had exerted his will over a powerful druid in Stonevale named Falgren Bloodbinder. He and his servants seek to collect the disc fragments to attempt to free Crom from his prison once more. 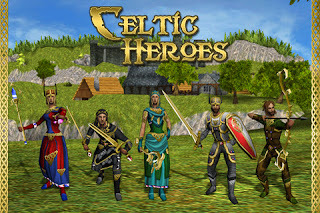 The remaining Wardens, now old and frail, seek to recruit new heroes to stop Falgren and his followers from once again bringing war to Dal Riata. Foiled in their plan to break the seals on Crom's prison, the Blackstone Cabal has continued to work to free their master. 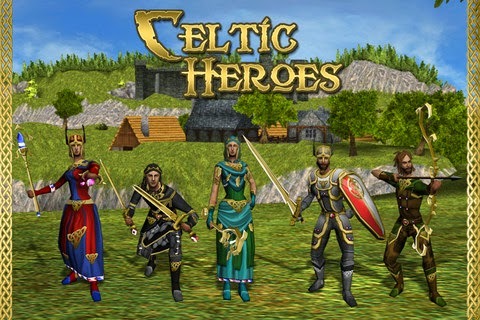 Hearing that the Blackstone Cabal continued to try and break down the prison walls, champions of Tir Na Og, the island of the gods, gathered to defeat the growing threat. However, what they encountered when they arrived was much too powerful for them. They were ambushed as they crossed through the portal by the Cabal's most powerful allies: The All-Seeing One, The Swamp Lord, The Chained King, Woodcrown the Ancient, Grommak the Stonelord, and Pyrus the Lavalord. Now, using the powerful crests that the champions were carrying, the Cabal's power has grown. Using the power of the mighty dragon Aggragoth, they seek to break the walls of Crom's prison. Click here to find out more history about Gelebron, and Gelebron's Tower, and how it fits into the larger storyline.